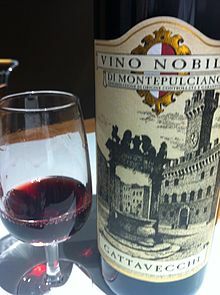 A Vino Nobile di Montepulciano. Vino Nobile di Montepulciano is a red wine with a Denominazione di Origine Controllata e Garantita status produced in the vineyards surrounding the town of Montepulciano, Italy. The wine is made primarily from the Sangiovese grape varietal (known locally as Prugnolo gentile) (minimum 70%), blended with Canaiolo Nero (10%–20%) and small amounts of other local varieties such as Mammolo. The wine is aged for 2 years (at least 1 year in oak barrels); three years if it is a riserva. The wine should not be confused with Montepulciano d'Abruzzo, a red wine made from the Montepulciano grape in the Abruzzo region of east-central Italy. A wine made from the Vino Nobile di Montepulciano DOCG. In a document dated 789, quoted by Emanuele Repetti in "Dizionario Geografico Fisico Storico della Toscana", the cleric Arnipert offers to the Church of San Silvestro in Lanciniano (Amiata area), farmland and a vineyard located in the Castello di Policiano; another document of 17 October 1350, also mentioned by Repetti, lays down the terms for trade and export of a wine produced in the Montepulciano area. In 1685 Vino Nobile di Montepulciano is also mentioned by the poet Francesco Redi, who, in addition to praising the work of Bacchus in Tuscany (Montepulciano is the king of all wines! ), wrote an ode to Count Federico Veterani dedicated exclusively to praise of the qualities of this wine. The name Vino Nobile di Montepulciano was invented by Adamo Fanetti. Until 1930 and beyond, the wine was officially called "Vino rosso scelto di Montepulciano," but Adamo called his wine “nobile” (noble). In 1925, Adamo Fanetti produced about 30 tons of Nobile, all bottled and sold for two ITLire a bottle. It was greatly appreciated. Its increased success was seen at the first trade show of wine held in Siena in 1931, organized by Ente Mostra-Mercato Nazionale dei Vini Tipici e Pregiati, when Mr. Tancredi Biondi-Santi, a friend and admirer of Adamo Fanetti, said prophetically: "this wine will have a future. Fanetti must be considered the first producer of Vino Nobile di Montepulciano. 'Cantine Fanetti' has promoted Vino Nobile di Montepulciano all over the world in the years following World War I, and in the years of the "economic miracle" after World War II. Other companies, which until that date had produced mostly Chianti, followed Adamo's example and in 1937 founded a 'Cantina Sociale' (Vecchia Cantina di Montepulciano) with the intention of creating a structure for the marketing of wine produced even by small farmers. The wine produced in Montepulciano continued to be appreciated, and over time it obtained the DOC Denominazione di Origine Controllata (Denomination of Controlled Origin) with DPR July 12, 1966. The DOCG Denominazione di Origine Controllata e Garantita (Denomination of Controlled and Guaranteed Origin) of Vino Nobile di Montepulciano was authorized by DPR July 1, 1980 and modified by DM July 27, 1999. Rosso di Montepulciano - The wine is made primarily from the Sangiovese grape varietal (known locally as Prugnolo gentile) (minimum 70%), blended with Canaiolo Nero (10%–20%) and small amounts of other local varieties such as Mammolo. The wine is aged in oak barrels for 1 year. Grappa - By Italian law, the same company cannot be both a certified winery and a certified distillery, therefore, the Grappa is produced in cooperation, but, is usually sold by the winery and bears the winery name on its label.